When Innisfree opened it's first store in Manila, I did not go crazy shopping as I knew the store stays for good! But, I have a list on top of my head on what to get and one of them is "concealer". I went ahead to ask the SA to take me to the concealer area and she took me to an area that confuses me a bit, I was given the option to choose from wide array of colors from the Smart Drawing Color Correcting Line. In this line, there are a total of 18 shades - not all are for concealing and correcting but it also includes strobing, contouring, foundation and blusher. Okay, I'm sure you'll get overwhelmed as well so don't be afraid to ask questions and talk to the friendly SAs, they are well-trained and they obviously knew what they are talking about. Now back to my purchase, I picked 01 Apricot Peach because I always conceal my undereye dark circles, peach is a great color correcting shade to lighten up that area. Half face test - applied alone! An easy way for you to achieve an even skin tone is with innisfree Smart Drawing Color Correcting. With a couple of swipes, you can say goodbye to skin prone to dullness, redness, or a yellowish hue. * Apricot Peach: Correct blue tones like dark circles under your eye. * Vanilla Green: Tone down redness like natural flush or blemish on the cheek areas. * Cream Purple: Correct yellow hues and creates a natural, more lively skin tone. * Lemon Yellow: Lighten mild redness or visible veins and brighten up dull looking skin tones. Housed in a tube with the same color as what's inside, it also comes with a build-in brush making this a perfect travel and touch-up product. Now here's the best part, I bet you didn't know that the tube can be "twisted back on and off" to prevent the product from squirting out during travel! Let me encircle it for you. 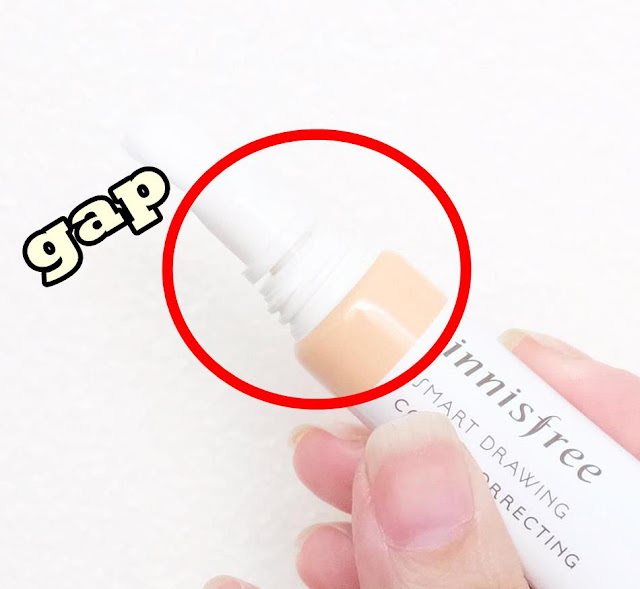 Gap means product will come out, twist back in and it will be "locked". I have to be honest though, I don't use this as often as possible because I tend to be lazy! Apricot peach is a light peach shade. This would work well as a concealer for users with light or fair complexion as this is a great corrector for users with medium to dark complexion. The consistency is not too thick or watery, I find it just right to blend the product easily. It is very important to squeeze just a small amount as a lot of product will come out immediately if you squeezed really hard and you can't put back in the product! As much as I'd love to use this brush to apply, I prefer to squeeze an amount needed at the back of my hand first before transferring it from my hand to my undereye area. This way, I get the ample amount of product needed without making a mess! Then I like to dab the product as shown on photo below. Make sure to apply a good amount if you want FULL coverage. Because the brush from the Innisfree Smart Drawing Color Correcting is filled with product, I have no choice but to use my clean fingers in spreading out the product with a dabbing motion, you may opt to use a sponge or separate brush. It does not only lessen the undereye darkness but it also brighten up the area! The corrector is expected to be "not my shade" so please don't tell me the shade isn't for me because it shouldn't be! The area is obviously lighter so it is expected to apply your concealer or foundation on top of a corrector. That way, the area is corrected so the rest of the makeup will appear more even. To some extent, this product also works as a highlighter so I tend to apply what's remaining on the brush on my nosebridge and chin. It is very important to wipe the brush with a makeup remover wipes before closing back the cap! That way, you get fresh new product on every use! How do you find the result of me using Innisfree Smart Drawing Color Correcting in Apricot peach? Do you use color correctors or do you conceal immediately?